Royal Jelly is a natural source of many nutrients. Royal Jelly is the only food for the Queen Bee, and it enables her to outlive worker bees thirty fold. The Queen Bee is also very fertile, laying up to 2,000 eggs each day throughout her life. Royal Jelly is a substance produced by worker honey bees. Bee colonies function on a hierarchical system: Bees all start out as unisex larvae, then they break off different roles within their colony. The worker bees, the drones, and The Queen Bee. The workers and drones have a typical life span of 3-4 months, whereas The Queen Been can live for up to 7 years. What differentiates the role of The Queen Bee from the workers and the drones is quite simply what she is fed- she starts off the same as the rest of colony but her diet transforms her into The Queen Bee. Workers and drones are fed royal jelly when they hatch, followed by pollen and honey for the following 6 days. The Queen Bee lives exclusively on royal jelly for her entire life. Suggested Usage: As a dietary supplement, take 1 softgel 1 to 2 times daily. Consider taking this product in combination with NOW® Co-Enzyme B-Complex and Rhodiola. Other Ingredients: Softgel capsule (gelatin, glycerin, water), Rice Bran Oil, Beeswax and Silica. 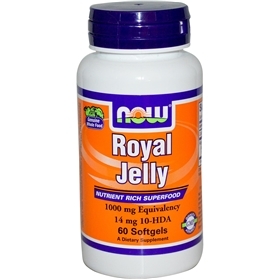 This Royal Jelly has been freeze-dried to maintain maximum stability and is among the finest products available. 10-HDA (hydroxy-d-decenoic acid) is one of the active, measureable componenets of Royal Jelly.